Complete Business Development Training for Lawyers, Zero Effort for Marketers. We've created the training curriculum, so you don't have to. Introducing the new Practice Boomers Content License. You may already have heard of Practice Boomers, the award-winning e-learning tool for lawyer BD training. The program includes a robust curriculum of 52 video tutorials, strategy worksheets, tactical action steps, and expert coaching that spells out exactly how lawyers can get their practices booming. If you'd rather manage coaching internally,, we are offering a special discount on our content license. The content license gives you access to the complete video curriculum, but none of the Pipeline or reporting features. Here's what you can do with a content license. Gain access to a library of 52 business development tutorials, each only five minutes long, and packed full of useful strategies and tactics. Alleviate the pressure on your marketing team to develop business development training content. Receive over 150 tactical, easy-to-complete Action Steps which help lawyers make meaningful business development progress in minimal time. Enjoy greater engagement from your lawyers, a stronger culture of business development, and increased originations. Receive step-by-step coaching guides that help you roll out an effective coaching program yourself. Scroll through our library of video topics. Build business development activities into your day so that client matters don’t dominate all your time. Learn how to set reasonable, achievable business development goals. Identify your strengths so your BD strategy is appropriate to your personality and interests. Divide your clients into categories based on their likelihood to refer new opportunities and manage your outreach accordingly. Identify leaders who can shepherd your career and open doors. Build relationships with the key influencers in your professional and personal communities. Target market verticals so you can more easily corner a niche and increase your marketability at the firm and in your network. Bolster your reputation as a thought-leader using these strategies. Develop a “personal branding message” so that your prospects can find you, remember you, and refer you more easily. Learn how to articulate what you do so you don’t sound like every other lawyer in your practice area. Get over the stigma of promoting yourself. Use these strategies to cheerlead your strengths into the firm and the marketplace. Use these strategies to begin a dialogue with key client contacts. Lawyers don’t always like the word, but learning sales techniques will improve your effectiveness at pitching. This lesson shows you how to build the foundation to a good pitch. Ask the questions that identify the emotional drivers behind your prospect’s need for legal work. Pitch a solution that goes beyond the generic so that you truly address the client’s needs. Your pitch will likely be met with resistance. Know how to overcome objections. Be proactive. Ask for the business. Use these techniques to close the follow-up loop. Seize untapped opportunities at the firm. These strategies will help you work within client teams more effectively. These strategies generate referrals and opportunities from your allies and prospects. This strategy deepens relationships with your top clients and introduces you to new prospects and referral sources. A good strategy is only as good as its implementation. Learn how to sustain your focus through accountability. Learn how to identify potential allies in networking groups. A good forum for meeting prospective clients and allies. Learn three group structures that deepen your contact with prospects and referral sources. Social time provides an excellent opportunity for client development. Learn how to make the most of it. An effective community service strategy goes far beyond pro-bono work. Learn “give to get” techniques that lead to new clients. Learn the best practices of networking so you give and receive meaningful referrals. Identify the “Allies” who will refer valid clients. This system helps you track the investment of time and resources you put into your business network. 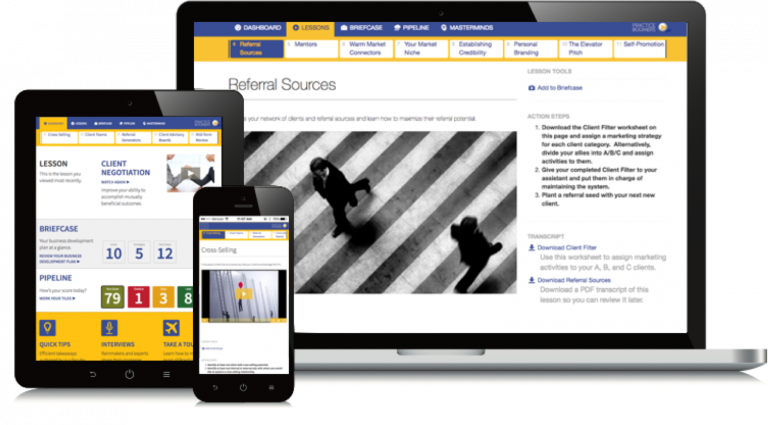 Communicate your needs to your network effectively so that they produce client referrals. It’s natural to become overwhelmed with client demands and allow BD to stall out. This lesson will turn things back around. Eliminate time-wasters and become a more efficient lawyer. Don’t spend all day in the in-box. Gain effective workflow strategies that keep you from getting buried in email. For the modern lawyer, social media is not an option, it’s a necessity. Develop your social media strategy so you don’t waste time online. LinkedIn is one of the most powerful, and underutilized prospecting tools available to you. Learn how to use it effectively. This blogging strategy puts you in front of prospective clients and key influencers. Make sure your LinkedIn profile communicates an effective digital brand. Advanced LinkedIn strategies for prospecting specific contacts. Site visits are a critical component in your BD strategy. An important skill in your arsenal – learn how to engage your audience and demonstrate your value. Understand how to promote your services without compromising your character. Learn how to navigate fee-sensitive clients while preserving the relationship. A lawyers’ risk-aversion can sabotage business development. Develop the ability to overcome the reservations that hold you back. Get prospects and Allies to see it your way. Loyalty is a critical element to both external and internal marketing. Find the champions who will go to bat for you. A summary of the curriculum. Fill out the form if you'd like to request more information. "I was fortunate to be exposed to this program when I was first developing a practice. I still apply these principles diligently today. As a result, I have a terrific practice which has progressed my career tremendously." "The program delivers on its promise. Our lawyers are significantly more engaged in business development, their strategies are more focused, and their response to the e-learning materials has been very positive." -Susanne Mandel, CMO, Lowndes, Drosdick, Doster, Kantor & Reed, P.A. ©2018 Ackert. All Rights Reserved.